Laminate flooring chart identifies common laminate floor problem characteristics, cause, recommended actions and the responsible party. Indentation Manufacturing Voids Dent in floor without fracture marks in plastic. Missing paper, damaged core, will show as irregular shape depression. Repair with the approved filler or replace board Manufacturer or installer if a highly visible defect. Scratches Manufacturing Scratches seen at time or following installation. Do not cross boards, generally in straight line. May repeat on multiple boards. Scratching during manufacturing. Replacement of scratched boards Manufacturer, or installer if highly visible and installed anyway. Delamination Laminate not adhering to core. May appear as a bubble on plank surface, delamination on edge about width of tapping block. Laminate moves, hollow sound, improperly used tapping block, swelling due to improper gluing Plank or section replacement Installer if not properly glued or installation damage. Manufacturer if laminate not attached. Proud Edges Height difference between planks when installed Milling Assess on basis of size and number and if outside of acceptable range, replace as required. Manufacturer, Installer if highly visible and floor should not have been installed. Pattern Misaligned Pattern no aligned on the core Improper manufacturing alignment Plank or section replacement Manufacturer, installer if highly visible and should not have been installed. Foreign matter under laminate Particles under laminate that show up either as marks, spots or lumps. Dust or debris during manufacturing. Generally light dependent and not seen until after installation. Replace as needed Manufacturer, installer if highly visible as it should have been seen and not installed. Improper Milling Floor unlevel or not square in areas Product out of square, defective tongue or groove. Replace as needed Manufacturer, installer if highly visible as it should have been seen and not installed. Chattermarks (Cuttermarks) Widthwise, wavy or rippled bands. Not seen in all lighting. Skips during sanding Replace Manufacturer, installer if highly visible as it should have been seen and not installed. I am trying to find some information on laminate flooring that after a year of being down is now peaking.. i was wondering if it is possible that the heat produced by a wood burning kanara could cause this as the floor that is the futherest away from this heat source is fine and has no peaking. While a problem such as this can not be diagnosed without an inspection it does sound like the area near the heating source is a lot drier than the areas of the floor that are further away. With a floating floor if there is a moisture imbalance the resulting stress in placed in one area of the floor can result in the problem showing in another. I would suggest that you try to determine if the floor is locked in at any walls or fixed objects and if it is correct that concern. Also keep your humidity controlled at the levels recommended by the manufacturer of your floor. My house in located in New Jersey. The summers are humid and the winters are very dry. My house is extremely dry in the winter. I installed my last laminate flloring in the summer after letting the laminate acclimate to my home for 3 days. The installation was easy and I had no real problems. I did notice that when the weather turned cold and my heat (very dry) was on, that some of the boards seperated on the long side of the boards. I suspect this is due to the extremely dry heat causing the boards to shrink. My question is, should I wait until the winter months to install a new laminate floor since the boards will acclimate to the dry heat and then in the summer they can expand due to leaving expansion room ? I’m installing the fllor on a concrete slab. You can install the floor any time of year. Make sure you acclimate the floor for several days. Since the summer is very humid make sure you leave plenty of expansion space. Test the concrete to make sure you it is dry enough and be sure to use whatever vapor barrier is asked for by the manufacturer of your floor. We have a laminate floor that after 9 months of feeling very solid to walk on, is now peaking and dipping. How much give should a floating floor have when stepped on, and should it have peaks and valleys? We live in North East PA.
We have had a 12mm laminate floor in our home for four years. The company that sold us this tile has come and examined it and here is the problem. We have a skylight and lots of sunny windows. The edge of the laminate does not have the UV protection on it. Now all the boards are wearing away on the beveled edge and green is showing on all the seams. The company says that the manufacturer they bought it from is now bankrupt. Is there a solution to this problem? Even though the manufacturer is bankrupt there is a slim chance that you may be able to find some of the matching laminate product through an internet search as long as you know what the product is. The tongue and groove locking mechanism is not the same with all laminate manufactures so if you were to find a matching color from a different manufacturer it is unlikely the different laminates would click together. If you have this laminate in more than one room and the floor is a click together and not a glue together you may be able to remove the laminate from one room and use it to replace the damaged laminate in another room. If one room or lets say part of a room is replaced with a different laminate that will not click together you would have to separate the different laminates by using a T-molding. These are a couple of ideas and perhaps others will have a suggestion for you and post it here. My son has bought a house that has laminate in the kitchen. It has a coating of grease, dirt and grime on top of the laminate in front of the stove, sink and refrig. Have tried different laminate cleaners and even a putty knife. Also tried a steamer cleaner. It is working some but have to work inch by inch and is very frustrating. I would think you wouldn’t be able to very lightly sand it off so am looking for a miracle cleaner. Unfortunately the floor may be beyond saving. Steaming of laminate floor is not recommended even though there are companies advertising their steamers for use on laminate. Sanding is out as the pattern on laminate is a printed paper and not a natural grain. Scraping can damage the plastic that is over the paper if you are not careful. You might want to try putting a 1-10 mixture of Simple Green in a spray bottle, spraying it on the soil allowing it to dwell for a few minutes and wiping off. Be sure not to over wet the floor as over wetting can cause problems of their own when it comes to laminate. If the Simple Green doesn’t work try acetone. Put the acetone on a cloth and wipe. I would suggest wearing a respirator and having good ventilation when using the acetone. I have a brand new laminate floor in my kitchen. Some water was spilled on it and was immediately wiped up. The floor has swelled along the seams and the edges have raised. How much moisture should a laminate floor be able to sustain. It doesn’t seem reasonable that any water on a kitchen floor would cause immediate damage. I agree with you that it doesn’t sound reasonable that a bit of water on a kitchen floor should cause problems. Unfortunately with some laminate floors especially many of the bargain priced ones it takes but a couple of minutes for water to damage them. With your moderately priced to better floors a small amount of water can “usually” be at the seam for 5 to 15 minutes before being wiped up and not cause a problem. Larger spills can be a problem on most all of the floors for the water gets below the laminate flooring and is absorbed back into the plank. Check your Warranty and see what it has to say about water and this will help you determine if you have a legitimate claim. Varnish may make it shiny but you do not have varnish on your laminate floor, what you have is a plastic wear layer. If you have any extra planks or can get extra planks an expert laminate floor installer can replace the damaged planks for you. I read reviews on how easy laminate flooring is. I am so aggravated. 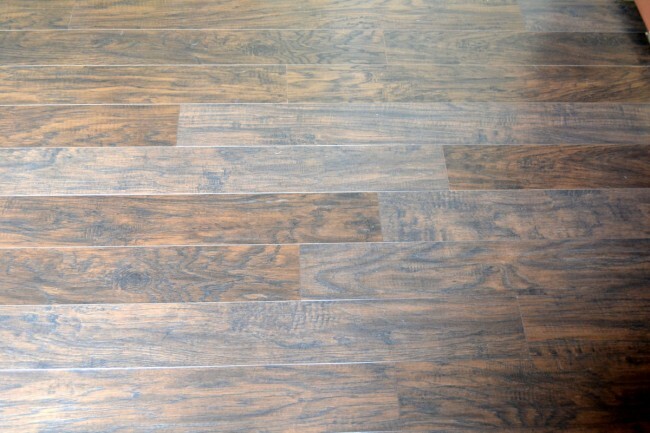 Laminate floor is high quality, dark in color,very shinny. I use Mop in Glow, mop only. Vinegar and water. This floor streaks no matter what I do. I have to mop and then take a dry mop over it until it is dry. Just read some where on line, hard water could be causing the problem. Please tell me you have herd of this before. Yes, hard water could be the problem. It is also possible that the Mop and Glow is leaving a residue on your laminate floor. If you know who the manufacturer of your laminate flooring is, look them up on the internet, locate the phone number of their technical department and give them a call. Find out what product they recommend for their floor. Be careful not to use too much of any product as even the best laminate cleaners will leave a residue if over used. You may be using too much cleaner or you may have hard water. You can purchase test strips at your local hardware or a place like Lowes or Home Depot to test your water. I had Empire install their laminate 3 weeks ago. I complained to the company that the color is several shades off of the sample we chose. If it were a little off, I wouldn’t care so much, but we were very specific with the salesperson that we wanted it to match close to our kitchen cabinets. Why would the shade be several shades off of what we thought we were getting? The company states that. This is “within normal” shade differences. This is a problem, and they won’t do anything! Please help me understand how this could happen…….Also, the laminate was not left in our home to acclimate. The manufacturer, per this company, states that they do not require acclimating the laminate, and they still guarantee it. Have you ever heard of this? The boards are already separating in many, many areas…..I’m concerned about keeping the flooring when it is already separating. It only makes sense that the flooring will become more problematic as time goes on… Do you have any thoughts on these two issues? Thank you in advance! we installed laminate flooring in our kitchen in 2009 and no problems. We just installed the same brand/style in our hallway in Nov. 2012 and it ‘crackles” in some spots when you walk on it. WHY ?? Some of more common problems include the laminate being locked in by a nail or screw or rubbing against the wall or another fixed object. Also the floor it was installed over had a low area this may be the cause. Hi. I need help with some answers to questions I have, I ordered and had installed laminate flooring in our home by a bid box store. I keep getting different answers from the installer ACS. Let me start from the beginning..they came to measure, and he told me my linoleum floor had a possibility that asbestos was in it. Did not think anything about it because I was installing new floor over old floor.The day they came they quickly advised me that the floor was uneven, they needed to pull up old floor and install new plywood. My husband said no because of asbestos. They quickly said they would not touch it because of asbestos. After much ado and 2 hours later they decided to put quick dry cement and a glue product in the low spots. $850 dollars more! When done with that they installed my floor the next day. After they were done the floor was uneven and making all kinds of cracking popping sounds and where there was no cement underneath the floor sank when you walked on it. The inspector came from ACS and said it was not done correctly and it was put down with the beams, instead of across the beams. So they came back pulled up floor and put cement and glue on the entire area. they came back next day to redo floor . I have Bruce Aged Terracotta 8mm. A few questions: The floor still crackles in some areas, could the floor still be uneven? Could the refrigerator be causing it because of its weight? Also some planks are not flush and reading earlier posts that may be ok however our shoes catch the edge of the seam. I don’t think that is normal, they tell me it is. Do you recommend a sealant to put on the tongue of the board. One room is the kitchen and the other a mud room. I heard 5 feet from water source and by entrances. I also read that it helps with the crackle sounds. My other question is: is it mandatory to put 1/4 inch space all around room or can one side be inch in some places and the opposite wall have a credit card width space? Thank you! Diane, You need the full expansion space the manufacturer calls for. If they require at least 1/4″ less is not okay. If a floor is not flat you will still get movement. If the floor is locked in as the result of not enough expansion space you will get movement and yes, even a heavy refrigerator may contribute to locking in a floor. Cracking related to expansion and contraction as weather changes may go away over time. As far an after market sealant for the tongue of the board I do not recommend one as most all manufacturers have already added the protection they deemed best. Hi. We had Parkay 12mm laminate installed in our home about 3 months ago. I am very disappointed because it scratches easily and the slightest thing that drops leaves a dent. I also noticed the edges wearing away. I’m sure this is not normal. This company has a great reputation from reviews I read. However, there is absolutly no number to be found to contact them. Do you have any advice for these issues? Thanks. I had a laminate floor installed over cement in my dining room. The floor seems solid on the right side and spongy on the left…this floor movement seems to radiate out from the far left corner. I think it is one of two issues. (1) no 1/8″ expansion space along the left wall, OR (2) the floor is not level in the top left corner (no mention of level compound at the time of installation…would have gladly paid to have that used IF that is the problem). Either way, I think the contractor should remove and relay the flooring. What are your thoughts? If the floor is being pinched against the wall as a result of inadequate expansion space the contractor that installed the floor should correct that situation without charge to you. If the substrate the floor is installed over is not flat within the flooring manufactures installation requirements that is also an installation concern. If the contractor did not tell you the substrate was not flat they should have. I agree with you that they should take care of the take up and relay though you should have to pay for the leveling of the floor as that is a costs you would have had if you had known of the problem prior to installation. Thank you for your quick logical answer. This info helps me make an informed decision. My husband just laid our new laminate floors and apparently did no research first. ..all h-joints! I’m not that bothered by the look of it, but how likely are structural problems from this mistake? H-joints are more of an appearance issue unless they are coupled with too short of a stagger resulting in the H-joints being near the end of the planks. I am considering replacing the flooring in my mobile home with laminate flooring, however we are snowbirds and the summer temps can reach 110 or more when we are not here. Will this be a problem with laminate flooring? Thanks for any help you can provide. When most laminate floors are installed in a residence or other building that is vacant for extended periods of time it often experiences problems. These problems can include gaps, buckles and plank separations to name a few. If I were you, I would discuss your situation with a good local flooring company that is familiar with the temperature and relativity fluctuations in your area. A local flooring expert that installs their own floors should be able to steer you in the right direction. Check the World Floor Covering Association wfca.org. National Wood Flooring Association nwfa.org and the North American Laminate Association website at NALFA.com. At these sites you will find local flooring experts. Is it normal to see ripples throughout the laminate flooring? We just had a walk though of a condo that we’re buying & we absolutely hate the ripples showing in the laminate. Is this created during the installation or a poor product choice? Lina, If the ripples are created by cupping where the sides of the planks are higher than the center,this is not normal. If the ripped are created by the pattern or texture on the surface, this could be normal. Give me a bit more information.